BARRY’S BAY – The clock had just struck 2:00 a.m. on November 17, 2011, when the phone rang. It awoke Mary and Clifford Blank, who were fast asleep in their home on Dunn Street in Barry’s Bay. Thinking it was a telemarketer or prank phone caller, they ignored the call. But when it rang again shortly after, Mary knew something was wrong. She jumped from her bed and answered the phone. She heard the trembling voice of her daughter-in-law, Aleata, on the other end of the line, calling from her home in Kiscoty, Alberta. Mary asked what was wrong. Aleata said something had happened to their son and her husband, Aaron Blank. Aaron was born and raised in Barry’s Bay, and grew up with two other brothers. He attended St. John Bosco School, and Madawaska Valley District High School. It was a call Aleata said she never wanted to make. 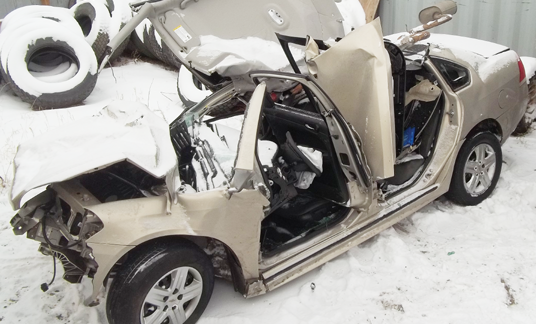 Aleata managed to explain that Aaron had been travelling home from a three-day training seminar in Red Deer, Alberta, when the vehicle he was travelling in was hit by a tractor trailer on a busy highway. All Aleata knew was that Aaron was alive and he was stabilized in a hospital in Vegreville, Alberta and then shipped to the University of Alberta hospital in Edmonton. Mary said she was relieved to hear that Aaron had survived the accident. Wanting to know more, Clifford immediately called the Royal Canadian Mounted Police in Alberta to get more information on what happened. Now recovering in his home in Kiscoty, Aaron still does not remember what exactly happened that evening. He pieces information together through what he can remember before the accident and what the RCMP concluded. Soon after, emergency crews arrived on scene, including the volunteer fire department from a nearby town. Clifford said it took crews over an hour to extricate his son out of the vehicle. His rental vehicle was squashed like a pop can. Miraculously, the driver’s side was sheltered by a small cavity large enough to keep Aaron protected. Aaron sustained several injuries, including 12 broken ribs, a punctured lung, a fractured skull, a badly bruised knee and numerous surface scrapes and scratches. Immediately, the officer said Aaron was going to live. Mary said she and Clifford stayed up all night, crying, talking, and praying. “That night was the darkest night of my life,” Mary said. She and Clifford decided to make the trip to Edmonton to be with their son in his time of need. They boarded a flight from Ottawa, and stayed in Alberta for around eight days with Aleata. This story continues in the January 19th issue of The Valley Gazette.